In the previous part I discussed the immigration procedure at YVR. Now as I successfully became resident of Canada, time to get all other necessary formalities done. In order to proceed, I started with SINning. SIN stands for Social Insurance Number and is a 9-digit number, something similar to Social Security Number in the United States. Similar to the U.S., it used to be issued on plastic cards, but Canada moved on and no longer does it this way as they do not want SIN card to be used as a form of (non-photo) ID. SIN should be produced only to the employer, federal offices and banks, as far as I understood during my visit to Service Canada. To get SIN, I had to go to Service Canada. Canadian Federal Government provides easy way to check out where is your closest one. For me, it was one next to Coquitlam City Hall. I went there next day after my arrival, still fighting jet lag. My uncle gave me a lift (oh, if you don’t know, currently I’m staying at my relatives’ place in Coquitlam) and went inside with me, precisely at 8:30am when they opened. Very nice and cheerful lady at the reception asked how she can help me. I said I need SIN and directed me to counter 5. Also nice gentleman took my passport and work permit and asked me whether I need SIN for myself, probably seeing I came to the office with my uncle. I responded him positively, and added “my uncle is already a citizen of Canada for 20 years”. “Don’t worry, you’ll become one soon too!”, the official told me. I found his approach quite surprising. He was verifying all the information, asking difficult questions (“What’s your date of birth?”), we also had a bit of small talk. He asked me about my plans for future and recommended me postgraduate in Canada instead of England. I told him it is a bit more expensive and got recommended studying in Quebec, which is free or very cheap and I do not even need to speak French (I told him I know zero French), as at Montreal universities they also use English. So, I got another letter-sized piece of paper with my SIN and confirmation of address, as well as information leaflets on privacy protection and instructions regarding who can request SIN from me (mainly employers, banks, federal government institutions and credit rating agencies). I have also received a welcoming handshake. “Congratulations!”, she said and gave me another handshake. She seemed so happy and cheerful that, I think, if she could, she would have hugged me. Since, despite our discussion with the official who issued me SIN, it was still early, we had to wait a bit before second important thing could be arranged, that is a local phone number. We approached BestBuy once it opened as first customers on that day. I did my research on mobile providers in BC, but even though, I ended up with different one than I expected. BestBuy offers all providers and it is possible to easily compare the offers and pick the most suitable one. To sign my contract, they needed to verify my credit rating and that meant I had to give consent to, ehm, Equifax to make a check on my credit score. This meant I had to give my SIN to Equifax. Remember, first get SIN, then your SIM card (opposite to alphabetical order). I was lucky to get a number that is easy to remember. Since now I had access to cellular data and could check public transit, after getting a Compass card (public transit card for Metro Vancouver) at the nearest ticket machine, my uncle was no longer afraid to leave on my own. I returned home and started researching banks. Conventional banks charge monthly fees here. I find that ridiculous, as why should I pay the bank to keep money with them and let them, in fact, invest them for their own profit. There are many online banks and FinTech banking start-ups in Canada, where there are no fees. Unfortunately, very few of them wants to open an account without Canada-issued photo ID, which I do not have yet. Gentleman at Service Canada told me to apply for B.C. Services Card, a form of photo ID, after three months of living in the province. The only bank I found that could open me an account using my passport and work permit is being restructured at the moment and was not accepting new customers until November. I had to look deeper and found some banks give discounts to the new residents. I finally decided to open my account with a conventional bank, which gives first year free of charges for people who just arrived to Canada to work or became permanent residents. I have found the nearest bank office and went there, this time alone, to open the account. I was received by Johnny, who turned out to be born in Vietnam. He brought me through the whole process of opening the account, gave me a debit card on the spot and together we cashed in some money I had, which Johnny used as an opportunity to show me how to use the Instant Teller machine and set up PIN for my new debit card. Honestly speaking, they are a bit outdated, compared to Europe, which he admitted and said the new, more modern one, will arrive soon. In Canada, it is also very important to build your credit score, if you want to e.g. to rent an apartment. For this reason, one needs a credit card. In opposition to Europe, it is very easy to get credit here. Johnny offered me $500 limit just like that, but to issue me a credit card, he needed, well… Canada-issued photo ID. Fortunately, he has given me a better hint than gentleman from Service Canada. Apparently it is possible to get one within a month, instead of three, for $35. He told me to pay a visit at ICBC, a crown company of British Columbia insuring cars and issuing driving licenses in the province, and request B.C. identification card. Since it was already too late, I went there next day. 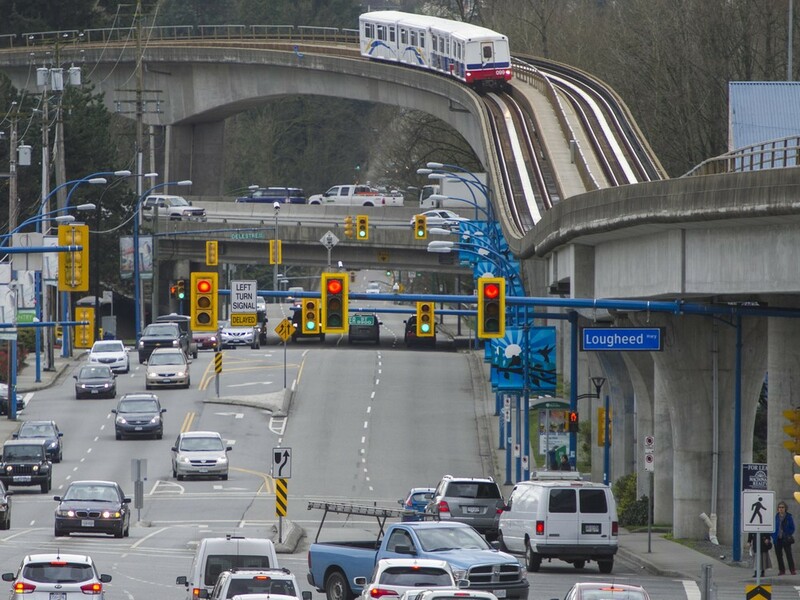 The closest ICBC office was in Metrotown, where I had to get with SkyTrain, entirely autonomous (yes, completely unmanned) metropolitan rail of Metro Vancouver, or, as called by my friend Deby, “very very slow rollercoaster”. The office was in huge mall called Metropolis. I have never been in so big shopping centre before. I managed to get lost few times, admired how many shops and institutions have been brought in a single place, and paid a visit to ICBC. With my passport and work permit, I was able to apply for the photo ID against the mentioned fee. I did not even need a picture — they were taking pictures at the place. Using the occasion, I have asked about exchanging my driving licence to local one (I have to do that within six months, if I want to drive) and was given a free preparation book for the exam (I need to take the theory and driving exam again). That’s enough bureaucracy for now. The only thing left is to wait for the BCID (arrives within 30 days) and apply for the credit card with it. Then I can fully enjoy life in Canada.